A Risk Bounce with Few Fundamental Footholds and a Large S&P 500 Tail, Dollar Breakout? Futures speculators are holding a strong long-Dollar position. How does that compare to shorter term retail FX participants? See how retail traders are positioning in the FX majors, indices, gold and oil intraday using the DailyFX speculative positioning data on the sentiment page. Risk trends took a smart jog higher this past session, but the motivation didn't last through the full trading day and it was notably uneven across asset classes. The peak expression of bullish interest was seen through US equity indices. The Dow and its peers posted a sizable gap higher on the open Wednesday morning, extending the rebound that began the previous day. This was an impressive session which would leverage claw back critical ground to fend off a far more troubling performance through October. At the end of the day, October still closed out the worst monthly performance in seven years. We get the same context from the Nasdaq 100 which finally won a higher high. That is the first such progression higher since 11 trading days, representing an unconvincing correction in an otherwise productive slide. Looking further into the core of the favored tech sector, the FAANG grouping posted its best daily charge since January 2016. This registers more of a bias influenced move than a catalyst rendering confidence. In other words, is was more likely a favorable perspective of the speculative rank that boosted Facebook following its afterhours earnings report rather than the other way around. We still have Apple's report due ahead, but the response to the update from Google, Amazon and Netflix are a case study to how sentiment controls fundamentals. With the S&P 500 assessing its next move with key support in a multi-year trendline standing as new resistance, it is worth evaluating how the benchmark index closed the day. With an intraday reversal from highs, the S&P 500 put in for its largest upper wick or tail since April 9th. If we are seeking out the next systemic move in fear or speculative appetite, we should look to conditions and motivations. There is far too little emphasis on the former and an inordinate obsession with the latter. Looking for the themes that could reasonably stage a genuine advance, the list of legitimate developments that can truly amplify speculative appetite rather than just beat back impending doom is extremely small. There is something to be said about earning gains however through averting a crisis that has already been discounted in the speculative market. Turning the corning of trade wars could be just such a passing of a severe fundamental storm. Yet, there is little hope to be drawn in anticipation of a genuine happy ending in the economic war between the United States and China. The White House's warning that the blanket of tariffs would be expanded to all Chinese imports if Presidents Trump and Xi couldn't come to a deal at the G20 summit on November 30 to December 1. Meanwhile, the October Chinese regional activity from the government showed a drop in economic health across the board with a drop in export orders specifically touching upon trade war fallout. Another theme that can play a role in undermining financial conditions owing to its importance in facilitating years of speculative reach is monetary policy. This past session, the Bank of Japan (BOJ) kept its trajectory completely unchanged, but the downgrade in inflation forecasts alongside warnings on financial and economic risks reflect struggle against arguably the most aggressive stimulus program of the developed world. If monetary policy is so ineffective, perhaps the side effects of promoting speculative excess should discourage its blind pursuit. Ahead, we have the Bank of England's (BOE) Super Thursday. A change in rates is extremely unlikely, but neither the MPC's Quarterly Report and Governor Carney are unlikely to hold back in its Brexit warnings. And, just in case we were doubting the attention afforded the divorce, GBPUSD rallied 60 pips in a matter of minutes Wednesday when the headlines misinterpreted the Brexit Ministers remarks on timing progress. As impressive as the Sterling's rally was on an intraday basis, its technical progress was clearly limited. The equally-weighted Pound Index I follow didn't even make it all the way up to its channel top and few other key GBP crosses would hint at a more systemic reversal. 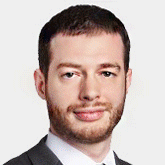 Drawing far more speculative discussion is the progress made being made by the US Dollar. The DXY Index cleared its previous swing high from August at 97, but the occasion didn't warrant any remarkable momentum. Considering there was little direct fundamental leverage to earn such a move, the lack of even short-term conviction doesn't come as much surprise. 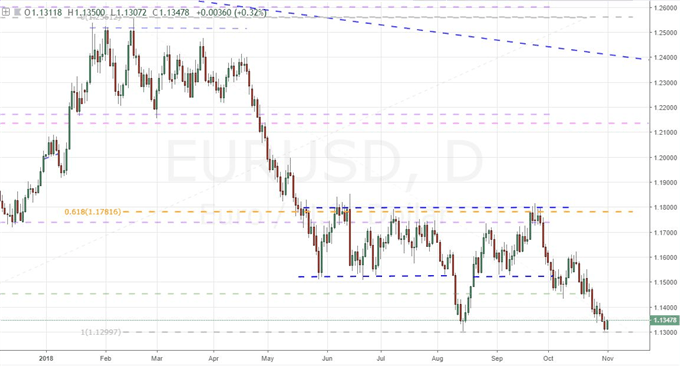 Further, noting that EURUSD represents the primary component of the trade weighted index, the pair made it to the August low of 1.1300 but has yet to break. Embroiled in trade wars, struggling to take advantage of any hawkish Fed policy views and the prominence of political risks leading into next week's midterm elections; any technical breaks should be reviewed critically. If the Dollar is to make a bid at its next leg higher, it is likely to ply on the weakness of its key counterparts - in particular the Euro, Pound and Yen. The Euro will face the Italian budget today with a high probability of unexpected headlines discussing the country's standoff with the EU. Sterling has the BOE decision, but the true risk comes via Brexit. From the Yen crosses, risk trends can offer the Dollar a bid; but expecting a speculative wave is presumptuous to say the least. While there are high profile events and far-reaching complex themes to keep tabs on, there are certain other developments in the market that deserve attention. The Australian Dollar was dealt further blows to its systemic use this past session. In addition to the trouble it has been dealt via volatile risk trends and the RBA's reticence, the 3Q consumer price index (CPI) further undercut hopes of an RBA hike with a 1.9 percent headline reading while China's PMIs posed yet another backflow trade threat. 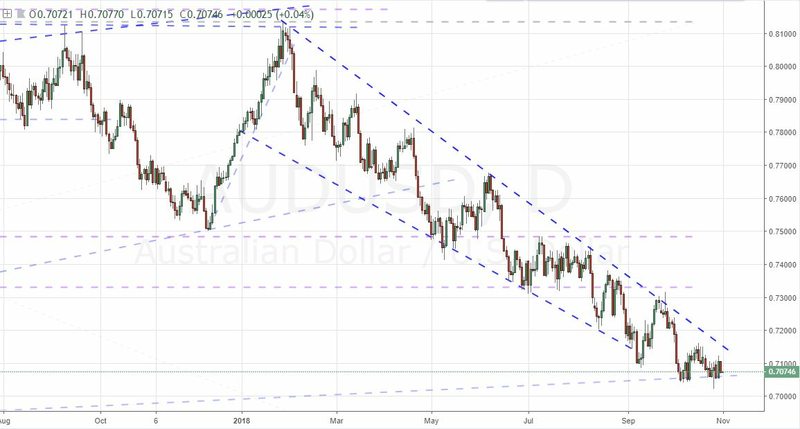 Despite all of this, however, AUDUSD has not extended its multi-month descending trend channel and has instead extended weeks of consolidation. This may seem a neutral perspective for the currency, but it genuinely suggests a bias. If the Australian Dollar can hold up against fundamental risks, how would it respond to genuine improvement in local fundamentals or carry appetite. Another currency move of note comes on behalf of the Mexican Peso. The currency has taken a sharp tumble this past week following the cancelling of a major airport project and then this past session's downgrade to its credit outlook by Fitch. Given the restraint of the Brazilian Real after a significant political shake up, the slide from the Peso looks even more remarkable. Finally, the nudge higher in the Dollar seems to be contributing to the performance of commodities lately. Gold has slid back towards former resistance as new support around $1,210. I expect little conviction from the move and instead continue to keep the metal in the repertoire in the event risk aversion tips fears over the ineffectiveness of monetary policy. As for crude oil, the break below 66 carries important technical weight, but it is unlikely to earn follow through. Supply figures were caveat ridden, but there is little potential for this theme to earn a serious move at this stage. Instead, we should consider locational risk in the WTI-Brent crude oil spread as the balance of supply shifts. We discuss all of this and more in today's Trading Video. Dow and US Equities Bait Dip Buyers and Recovery Skeptics Alike, Will GDP Factor? Nasdaq Leads US Markets with Worst Drop in 7 Years, Will ECB Surprise More than BoC?